I met the guys from By The Horns Brewing* and their excellent ales at last year's LBA Showcase at Vinopolis, so when I heard that they were having a couple of open days over the weekend my interest was piqued. Like so many others these days, the brewery is tucked into one of a row of uniform industrial units, in this case just around the back of Wimbledon dog track. I guess the dogs keep the Wombles from nicking the casks... The five-barrel brewing kit looks good - managing director Chris Mills, who set up the brewery along with Alex Bull, says it's mostly ex-Amstel vessels, converted by Oban Ales up in Argyll. They currently have three fermenters and are planning to add a fourth, along with a conditioning tank. While they had five ales for sale on gravity, the biggest change from what I saw last year when it was all cask was the large spread of bottles on the table. Having started bottling last month, Chris and Alex now bottle all their ales themselves as well as selling them in cask. As well as some local distribution - although of course they are on the look-out for more - Chris says they have beer going up to Manchester. Interestingly, all the bottles are 330ml, rather than the 500ml I would have expected. Alex says that as well as reflecting how he and Chris like to drink (out of half-pint stemmed glasses), he feels the smaller bottles have "more of a young, contemporary look" that fits well with the bars they target. The regulars are: Stiff Upper Lip, a 3.9% pale ale with Sonnet and Pioneer hops and a nice balance between a biscuity body and dry-bitter citrusy hops; Bobby on the Wheat, a 4.7% cloudy pale wheat ale with faint lemon and lactic tangs; Diamond Geezer, a 4.9% red ale with lots of sultanas and other fruit on the nose and then a nutty almost pecan pie body; and the newest addition Lambeth Walk, which is a tasty 5.1% dark porter with notes of treacle toffee, ginger and cocoa. They're also doing specials and seasonals - I came away with an as-yet unopened bottle of Jolly Fatman, their winter spiced oatmeal stout, and they had a 6.4% 'double' version of the Diamond Geezer red ale in both bottles and cask. If you just thought Double Diamond I guess you're old like me - being younger, they called it Diamond Geezers instead. I was driving, so after buying a few bottles and thanking Alex and Chris for the hospitality and the tasty samples, that was my limit. 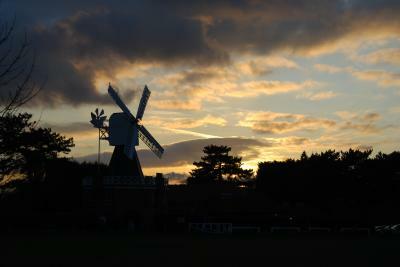 Fortunately the trip back was equally pleasant - a walk on Wimbledon Common and then coffee at the snack bar by the windmill, as the sun was setting. All Saturday afternoons should be like this! *Their website's remarkably uninformative, apart from a link to the brewery's Facebook page, which is a bit more helpful - as long as you have a Facebook account, I suppose... There's also the brewery's RateBeer page which lists the beers.